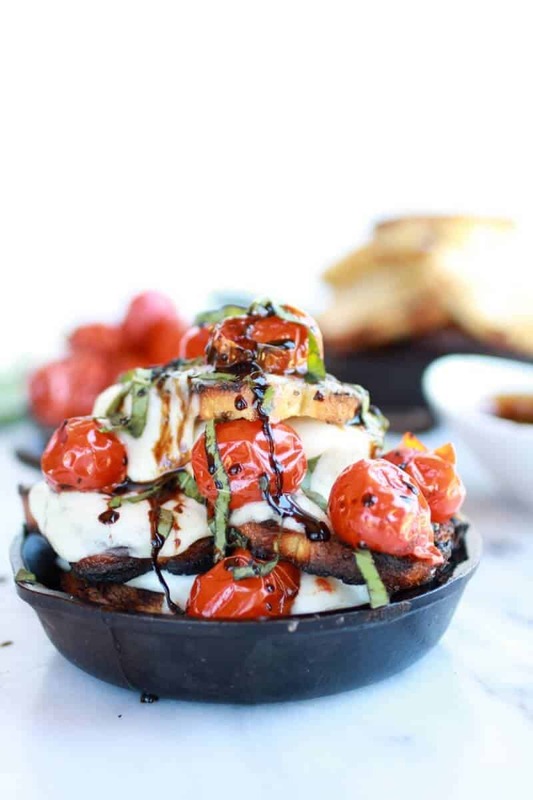 Caprese nachos are a real thing. A real, cheesy, hot, crunchy, tomatoey, fresh basily thing. Also a no oven, no heating up the house thing too, if you choose. Normally the whole heating up the house in the summer thing is no big deal to me and I don’t typically understand why people make such a fuss about using the oven in the summer, but now that I have been in South Carolina for a day I understand completely. I mean, whoa. You guys are not kidding down here. The humidity is insane, but the humidity plus the sun plus the 90 degrees temps. It is darn hot down here. I mean, I am still loving it, but I am definitely thinking the grill is the way to go down here. So let’s talk about these nachos. They really are like a french meets italian nacho and they are obviously good. Simple, but so good. I think that caprese has to be one of my favorite summer type of dish. I am pretty sure I eat it in one form or another almost everyday throughout the summer. Now let me rant about my beef and tomatoes. Ninety percent of the time I only buy tom-tom tomatoes (or grape or cherry or whatever else you may call them). I almost never buy the beef tomatoes and only occasionally buy Roma, but only when they are in season and so gosh darn good. I would love to by the heirloom tomatoes, but honestly I just can not justify spending that much for tomatoes that I could scarf in less than a minute. I love the multi colored grape tomatoes, but again they are a little pricey to be buying every week. So why do I stick to the grape tomatoes? Because in my opinion they have the best flavor. Unless I am picking the tomato off the vine, I still have yet to have an amazing beef steak tomato. The flavor of the grape tomatoes are normally pretty reliably good, especially if they are the really small ones. I can always count on the small ones. I know, I am a freak about my tomatoes and I also know lots of you are probably going to disagree with me, but this is just my experience with tomatoes. Plus, I really love just popping those juicy things in my mouth. I have been known to eat pints ate a time. Like just the tomatoes, nothing else, not even any salt. Okay, now these are not normal nachos with tortilla chips. I mean, I am sure that would be good, but the grilled (or toasted) bread is 100x better. I mean I am pretty sure most of you would be cool with eating just the grilled bread. 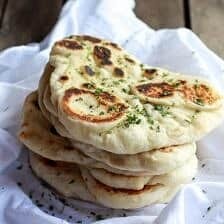 Grilled bread is a new favorite food of mine, can’t believe how good it is. But really, I think you know this whole thing is good. 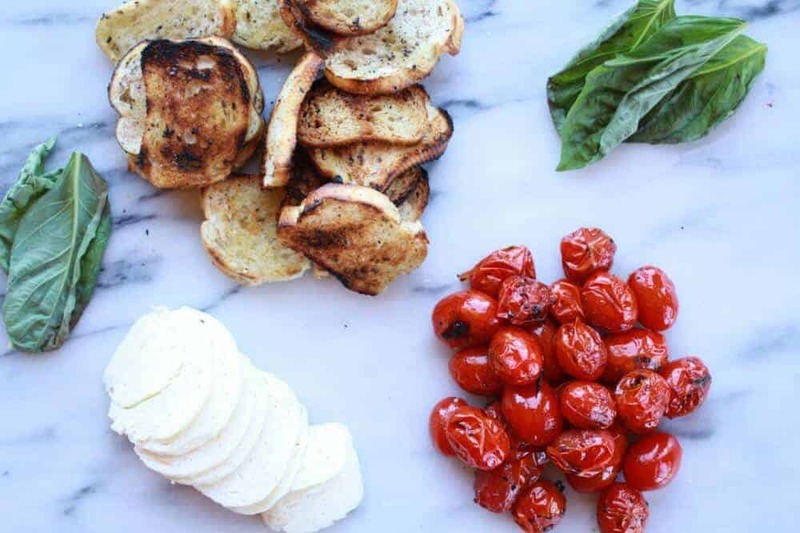 If you love caprese this is for you. 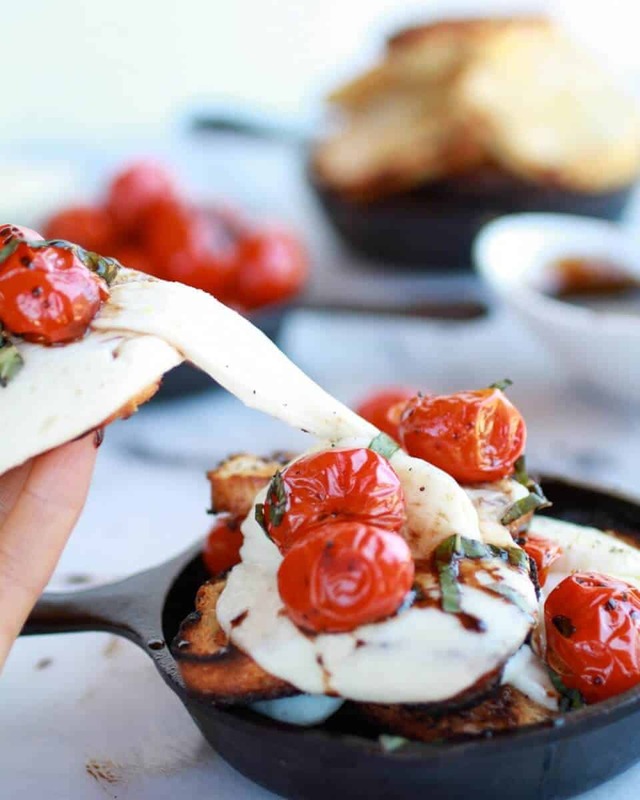 If you love melty mozzarella cheese this is for you. If you love grilled bread or even toasted bread this is for you. And if you love tomatoes and basil this is for you. Basically, there is not really anyway it can’t be for you. To make the balsamic glaze add the balsamic vinegar and brown sugar to small sauce pan and simmer until reduced by half. This should take about 10 to 15 minutes. Remove from the heat and set aside until ready to use. Preheat your grill to high heat or preheat your oven to 450° degrees F.
Place the baguette slices on a greased baking sheet and brush each side of the bread with a little olive oil and a sprinkle of salt and pepper. Grill the tomatoes for about 8 to 10 minutes and the baguette slices for about 3 minutes per side. Or you can toast the baguette slices in the oven on a baking sheet for about 5 minutes and the tomatoes in the oven for 10. Preheat the broiler to high. 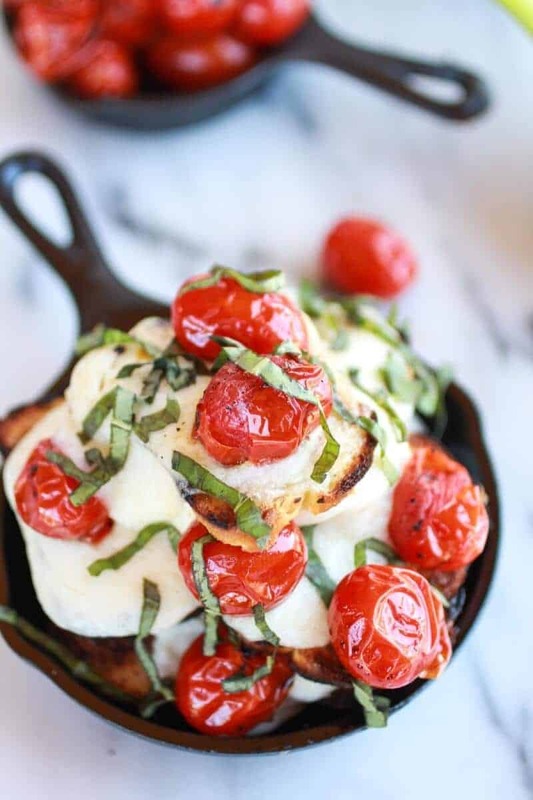 In personal oven safe dishes or a pan or sheet, place a few slices of toasted bread, then a few slices of fresh mozzarella and then a handful of tomatoes. Repeat so you make about three layers. Broil for 1 minute or until the cheese is melty. Unless of your course you are one of my brothers. 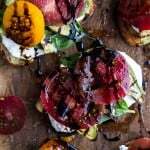 Grilled Caprese Toast with Burrata Cheese + Grilled Avocados. 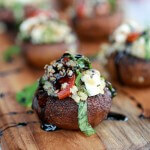 Caprese Quinoa Grilled Stuffed Mushrooms with Balsamic Glaze. 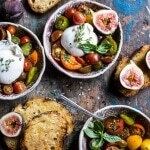 Marinated Cherry Tomatoes with Burrata + Toast. Cheesy Margherita Pizza Hummus with Grilled Pesto Pizza Bread. GORGEOUS. I’m in LOVE with this idea. Fab. Thank you so much, Jamie! That Balsamic Glaze. I could drink that. I always have balsamic reduction around. 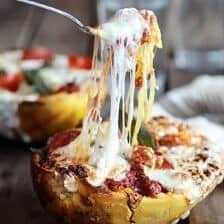 I make a big batch and then just spoon it on everything I can think of 🙂 Gorgeous recipe & pics! I know, I love the stuff so much!! Thank you, Averie! Thank you, Jenna! 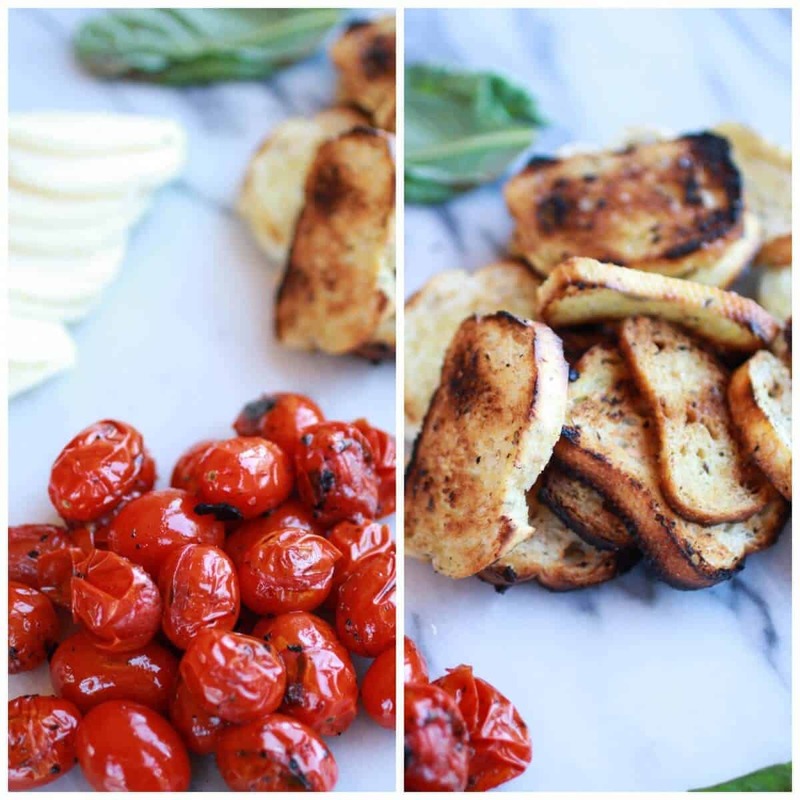 Oh and I am glad you like roasted grape tomatoes because I have 2 recipes coming up with them as the star! 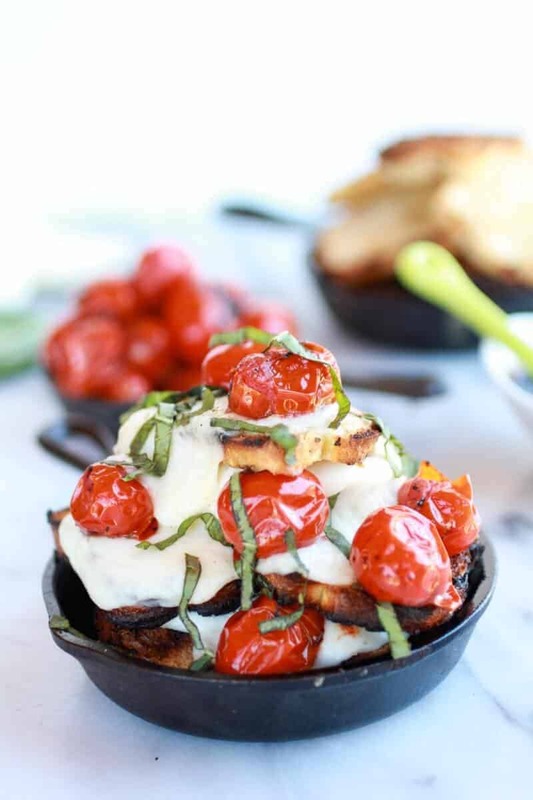 This is an absolute amazing idea and I can’t believe I’ve never thought of caprese nachos! I think I just died and went to foodie heaven. Haha! Thank you so much, Faith! 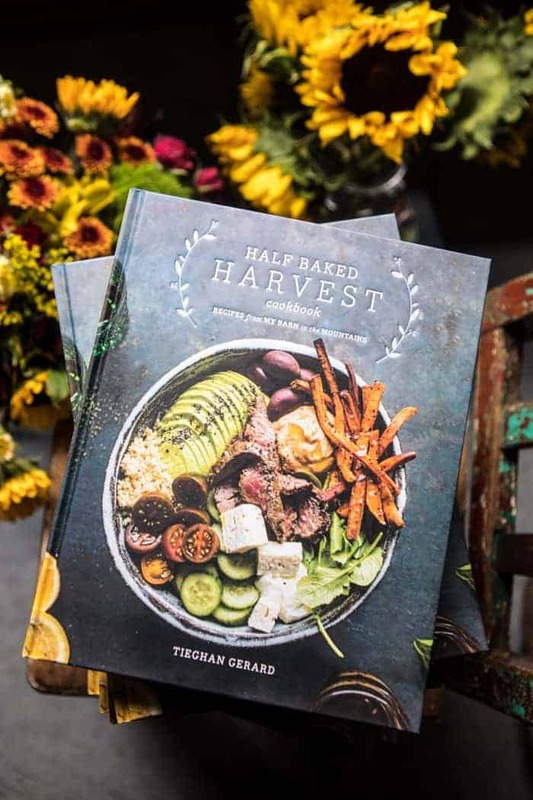 Ooooh these look amazing, Tieghan!!! 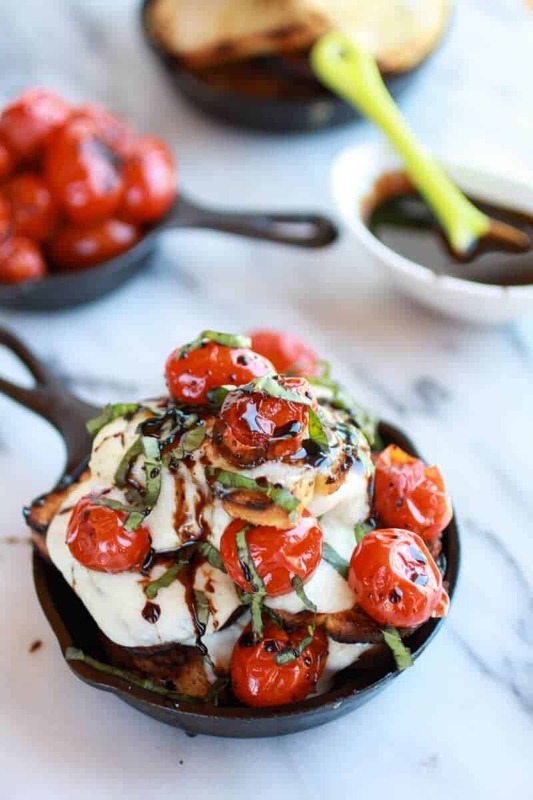 You know I’m all about Caprese, well, everything!!! What a great idea!!! Gotta try these!!! Thank you so much, Robyn! I love caprese anything as well! Especially when it is all warm and melty! Tieghan!!! Whoa girl, I mean… whoa!!! This is beyond awesome. This is GENIUS! I love caprese anything and I LOVE nachos. How perfect! I love this unique twist on nachos! Thank you so much, Jen! Just pure genius and so unique. I love the little skillets! Thank you so much, Cassie!! Hope you are having a great day! Gorgeous! I love those cute little serving pans too. ANd I’m with you, in season tomatoes are so amazing compare to how gross those anemic, out of season, grown in a warehouse, Romas are. This is such an incredible idea! 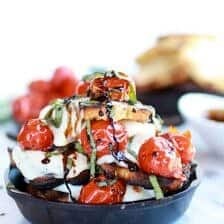 I have heard of many caprese variations, but never nachos, which is so genius! yum!! These would be perfect for dinner. Love that they are in a tiny skillet. Oh god, you’re killing me!! So many delicious recipes on your site, I’m putting on weight just looking at them! Printed so I can make this deliciousness! Haha! Thank you, Annie! Hoep you love these! I’m loving the small cast iron skillets in the photos. We have Wegman’s here in Western NY, and they have these little cast iron skillets for $10 each. I’ve been watching them every week, waiting for the price to go down, knowing that I cannot justify buying them for that price. I think you just gave me my justification!! Haha! I bought mine from amazon for eight dollars, but I can’t find them anymore! Hope you love these! Ahh!! Thank you!! why didn’t I think of Amazon? I’m on there everyday… the question is… did you buy the 3″ or the 5″? In my mind, the 5″ is better.. more tomatoey/cheesey/balsamicy goodness for each person! HELL YES. I want to nacho-fy every meal now. Haha!! Hell yes, that sounds awesome! Yes! For sure, thank nessa! You have made magic happen. This looks SOO GOOOOD. You’re a genius! I love this! It’s all my favorite flavors of summer! I LOVE this! 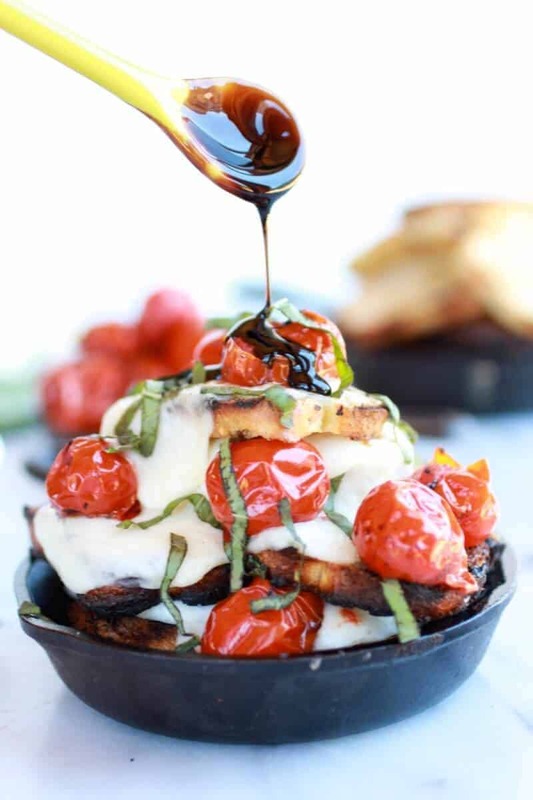 And that balsamic glaze – GENIUS! Oh my… WANT WANT WANT!! Haha! Thank you, Tessa!! I was sos excited to see your comment! Just came across you via foodgawker, and love, just love these nachos! We’ve such a glut all summer long of toms and basil here in the Med, in Malta, that I run out of innovative ways to use them. Nothing beats a caprese but this is a new take. I’ll be making it as a niblet for a BBQ I have next week. Lovely work on your blog Tieghan. Will be back! Wish I’d started cooking young – my mum couldn’t get me in the kitchen for love nor money at your age! Haha! Thank you so much, Liz! I am so happy you like my site and so happy you are going to give these a try! I think you will love them! 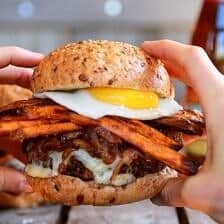 This photo on foodgawker totally jumped out at me. Besides the amazing photos, what a wildly creative and delicious idea! 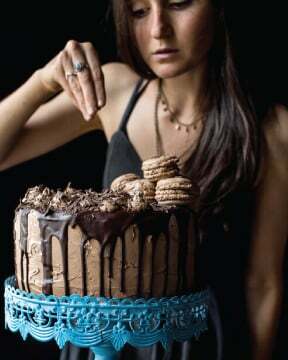 I am totally making this over the weekend. Thanks for the inspiration Tieghan! Thank you, Chris! Hope you love these! dang girl. I wish i was your neighbor. Yep. I really need these in my life! 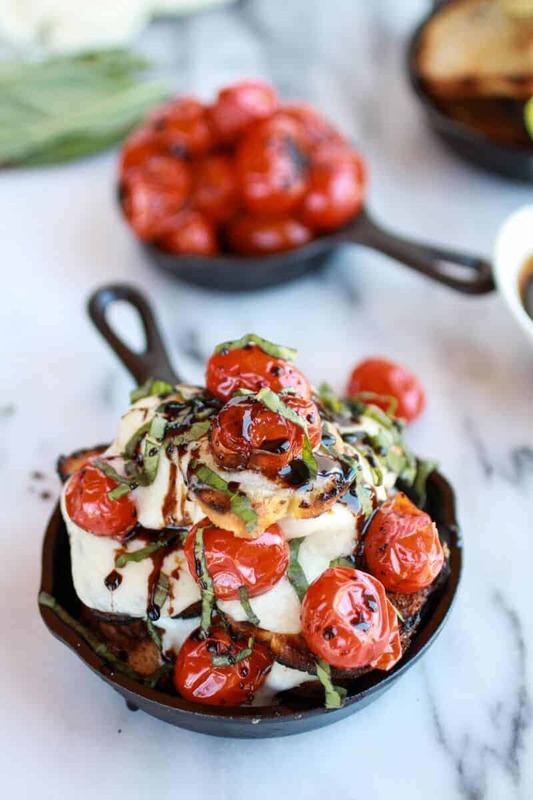 Caprese is one of my all time favorite things, and the mere thought of this dish has me drooling. YUM! What a creative, beautiful presentation with incredible photos. 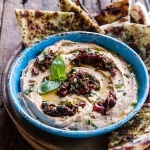 I just pinned this recipe on my “must try” board. Thanks for sharing this recipe on Marvelous Mondays. Thank you so much, Michele! Thank you! You are too nice!! This looks SO good! TFS! Thank you so much, Pam! Haha! Thank you so much, Nikki! I made these for family and friends the other day and they were AMAZING! I now keep the balsamic reduction in my fridge at all times. Thanks for another fabulous recipe! Oh yay!! So happy you guys loved these! 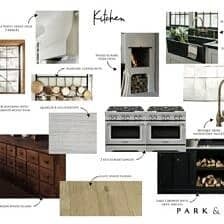 Looks beautiful and can’t wait to make this! Tomorrow! Or maybe today. Thanks Cynthia! Hope you love this!! Thank you! Hope you love this! So happy you loved them! Thanks! I saw this picture on tumblr and a link to the recipe (this is one of the reasons I love tumblr) and decided to try it. I did it yesterday to my big family, and even the little ones enjoyed it…it was like WWIII to see which one of us ate the most quantity! Just delicious. Thank you!